On 14 August 2005 we went to breakfast at 8:30. Claire's friend Tegan, the thirteenth and final member of our tour group, joined us. She was delayed by the yet unfinished British Airways strike. 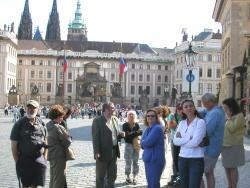 Our tour began with a very knowledgeable Czech-born private tour guide named Otto. Besides Czech and English, he could speak German and Russian. Our group boarded a large van at 9:20 and enjoyed the educating commentary of Otto during our trip across the Vltava River to Prague Castle. Built on a high hill overlooking the city, the castle was begun in 870 A.D. 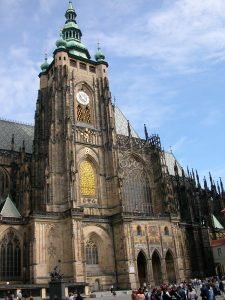 Inside is the Royal Palace and St. Vitus Cathedral. We did cosiderable walking through much of the palace and the cathedral. The history of the castle and its buildings is beyond what can be written here. All but four of the people in our group purposely remained behind when we left the castle at the completion of our morning tour. We remaining four were dropped off by request before crossing the river. Michael and Jeannie soon found a place to eat lunch. After a tasty Czech meal of roasted lamb and cabbage, we had delicious apple strudel. This dessert is a Czech specialty. While we were eating, it began to sprinkle. Light rain fell intermittently the rest of the afternoon while we explored numerous shops. We visited the ornate Church of St. Nicholas in the Little Quarter. This is the first cathedral we ever had to pay an admission fee (50 crowns) to enter. We climbed the many steps to the top of the Lesser Town Bridge Tower. 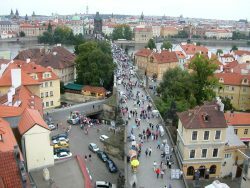 After climbing back down the many steps, we walked across the Charles Bridge. This famous bridge always seems filled with many thousands of tourists. Lots of trinkets and drawings are sold on the bridge, even in the rain. When it started pouring, we found a quaint pizzeria overlooking the water beside the Charles Bridge. We ate very good insalata caprese and shared a pizza. Before entering we asked about using a credit card and learned we would have to first go to a nearby exchange site so we could pay in crowns. (We had again run out of Czech cash.) The pizzeria would except euros, but not dollars. After supper Michael found some straciatella gelato that really tasted Italian. As it was getting dark we returned to the hotel to pack for Monday's departure for Vienna. 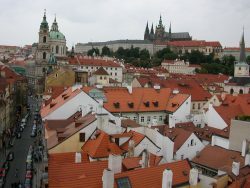 The weather in Prague was quite cool except when the sun was shining in mid-day. Otto commented that summers are cooler than they once were. And winters are warmer. He remembered they had snow every Christmas when he was young, but there is snow on the ground only about one in three Christmases now in Prague. 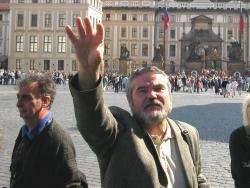 The Prague phone book listed 15 with the Tůma surname. There was no Thuma. 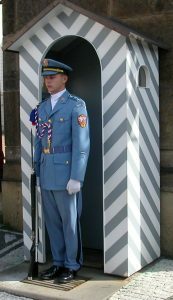 Svoboda is a common Czech surname. 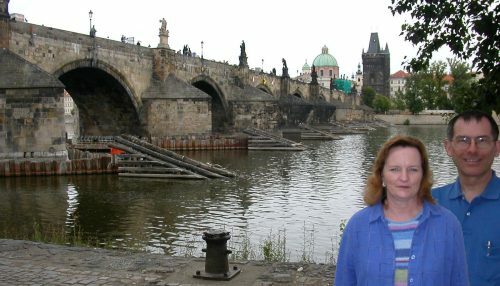 We saw nothing in the Czech Republic that even remotely suggested that the country had once been under Soviet control.